I recently shared my best babymoon ideas and some tips and advice for planning a really good babymoon, but aside from mentioning the places I'd been on my two babymoons, I didn't really give you any other ideas for best places for a babymoon. So that's what I'm doing today; sharing a fab list of the best destinations for a babymoon so you can decide where to go for your babymoon, a special holiday you enjoy before the arrival of a new child to your family. All the babymoon places on this list have been tried and tested by me or by someone I know and trust. They would all make really great babymoon destinations for a variety of reasons depending if you're looking for a resort you can relax in or a place you can head to to enjoy a fun city break. The Best Babymoon Destinations in the World, Tried & Tested! RELATED POSTS: Tips for Planning a Babymoon, Tips and Advice for Travel While Pregnant, A Luxury Babymoon in Phuket, Thailand, A Family Babymoon in Sani Resort, Greece, and Why (and When) You Should Travel With Kids. If you already have a child or children, and yet you still want to head to something close to a relaxing babymoon getaway, these are the places you should have on your list, although I think all of them would still make perfect luxury babymoon destinations for just adults too. The last few family holidays we've done have all been to resorts that could easily double up as an excellent destination for a babymoon for a young family, i.e. they've all had kids clubs! If you have the budget and want your babymoon to be an amazing once-in-a-lifetime holiday then Kandima Maldives is definitely worth considering. It's not as pricey as many island resorts in the Maldives, and is by consequence a little more informal and relaxed (perfect with kids!) but you can still enjoy total luxury when you want to, and needless to say, you're in the Maldives so the surroundings and location really are one of a kind. You can read my review of Kandima Maldives here. Another good thing about the Maldives is that it's a great babymoon destination in winter as it's nearly always warm and sunny there. In the same vein, I can highly recommend Sani Resort on the Greek mainland as a family-friendly babymoon destination as that's exactly what we used this five star resort for recently. We stayed at Sani Club which is absolutely a family resort with a fab kids club (for all ages from 0 upwards) and the restaurants and other facilities were all geared up to kids, but at the same time you could enjoy adults-only luxury in the spa or in some of the other restaurants in the resort. If you did want to go to the Sani Resort but only have the baby in the belly, then I hear Sani Dunes is the adults-only hotel in the resort. Here's my full review of Sani Club. While I didn't fall in love with Grand Palladium in Ibiza the same way I did Kandima and Sani Resort, it had a lot going for it and one of these things was the way it was brilliantly set up for young families. Again, you can enjoy adults-only time in the spa and of course you could easily leave the resort to find other beach bars and restaurants that aren't for families. However, going there with our young son worked brilliantly for us as we got to drop him off at the kids club for a few hours in the morning while we swam and sunbathed, and we also took advantage of the babysitters' club at night. Also, as per my advice above, there is a ridiculously short transfer time from the airport to the resort! Read my review of Grand Palladium Palace here. The Selman in Marrakech is one of my favourite hotels I've ever stayed at and I am sure we will go back one day soon, especially as they have built an extensive kids club since we were there. We went as just a couple back before we were even thinking about kids, and it was a very relaxing week enjoying some real designer luxury. We loved the swimming pool, breakfasts on the terrace and Sunday brunch, so if I could go back and enjoy these again while my son(s!) are happy in daycare I would find that easily as relaxing and fun as any babymoon should be. You can see some photos of our stay at The Selman here. Point Yamu by COMO in Phuket, Thailand would be my first recommendation for anyone wanting to head that way for a babymoon. As I write in my review here, it perfectly combines luxury with child-friendly facilities and striking design. There is also a beach club on an island that you can take a day trip to, and it's perfectly set up for kids to enjoy with sand toys and games. Also the resort's kids club is one of the best we've enjoyed and the babysitting services were excellent. Read my full review of COMO Point Yamu. Finally, The Surin, also in Phuket was one of our Thailand babymoon hotels and guests were a pretty even mix of adults only couples and groups, or families meaning it would be fine to go with young children. I'm not sure what other facilities they have for children in the resort, as I was pregnant with my first at the time, but the private beach was a perfect place for kids to play and there were definitely water sport activities for older kids to enjoy. Furthermore, the Thai people, in general, are so warm and welcoming to young children that they will practically thank you for bringing your kid with you on your babymoon! Find some photos and words about The Surin in this post about our Phuket babymoon. As both of our child-free babymoon destinations were actually also suitable for families, I turned to a few of my blogging friends to ask them where they went on their adults-only babymoons and they're suggestions are fab, and not necessarily the usual suspects! 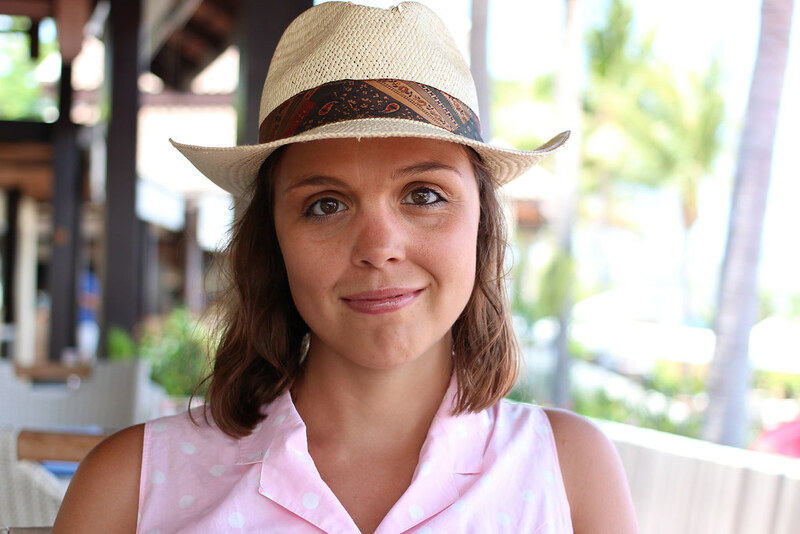 Here we go, firstly with Emily from Luxury Backpack who went to Key West on her babymoon. We decided to head to Key West for a luxurious babymoon last year. Nestled down at the southernmost point in the Florida Keys, this town has so much character and charm. The buildings are stunning, the people friendly, and there is so much choice when it comes to drinking and eating. We explored a little, but also spent a lot of time reading and drinking virgin mojitos by the pool. Despite the plethora of hotels in Key West, where to stay was an easy choice. I had wanted to stay at the iconic Southernmost House Hotel for ages, so a special babymoon weekend was the perfect excuse! It is an stunning hotel that has a personal luxurious feel, beautiful rooms with four-poster beds, and a pool with ocean views. It will stay firmly in my memory forever. Getting to Key West is fairly straightforward despite its remote location. You can fly to Miami and drive the 3.5 hours south through the Keys along the scenic Overseas Highway. You might even be tempted to spend a night in Islamorada or Marathon to break up the trip. Otherwise Key West has a small airport you can fly to from many domestic airports. I cannot recommend the Florida Keys and Key West enough for a memorable, relaxing, tropical babymoon! You can follow Emily's family travels on Instagram. Most people think of "Babymoons" as a romantic trip that you and your partner go to before the big day. However, with another tot in the house, my husband decided to gift to me the ULTIMATE babymoon- a trip to Hawaii... all by myself! I mean, a few days where I didn't have to deal with potty training or tantrums could have been a babymoon enough, but we decided to go all out. I chose Hawaii because I had a ton of points and miles to use, so it was SUPER cheap to fly there. It cost no more than a flight to a few States over! But I also wanted a location that didn't just feel like another US State. As a person who has travelled the world, I wanted somewhere with a different "local culture" but still be "safe enough" going while expecting a little one. Finally, I chose Hawaii because of all the yoga retreat options. I knew that I wouldn't just want to sit on the beach all day with a big ol belly but that I also wouldn't be able to do some more of the more strenuous or adventurous activities that I typically like to do while not pregnant. I love yoga so it was the perfect balance to not only be active, see Hawaii but also connect a bit with myself AND baby! Knowing my other kiddo was home safe with Daddy gave me a week of calm and reprise. I came home ready to tackle daily life again, rejuvenated and centered and focused. While a trip with just the hubby is always great and we take at least one trip just the two of us each year, having a babymoon where I could just focus on ME was just what this pregnant mama needed!!! Be sure to follow LeAnna's ongoing travels on Instagram. And don't think you need to be near a beach, Clare from Epic Road Rides went to a stunning resort in Utah, USA on her babymoon. We visited Amangiri in Utah, USA on our babymoon and we absolutely loved it. The resort is like something out of a James Bond movie. It sits within 600 acres of the Colorado Plateau in splendid solitude. As you approach it, the resort looks a bit like a bunker, with it’s straight, concrete lines against the red rocks of the desert around it. It's stark, yet strangely beautiful. It's certainly a great babymoon destination in the USA. You may be in the middle of nowhere, but don’t be mistaken. This is a seriously luxurious hotel and Aman is one of the world’s best hotel chains. The restaurant is exquisite - you eat seasonal produce (carefully selected to be mother-to-be friendly!) alongside grand floor to ceiling windows that make you feel like you’re sitting in the middle of the desert. There’s an incredible 25,000 foot spa which offers tranquil pools to relax by and massages for mothers-to-be. If you’re feeling more energetic, there are slot canyons you can walk to. One of our favourite areas to chill out in was main pool area. It’s cut into a lofty rock escarpment and the main pool curves around this. So as you swim, you’ve got an elegant, modern resort on one side and on the other a craggy rock face that’s millions of years old. We had a wonderful stay at Amangiri and would love to return (but not with the kids)! Yes, I'm biased because it's my home, but I truly think Amsterdam is a great babymoon destination if you're pregnant. It's easy to get around because it's relatively small and compact (compared to the likes of London or Berlin) and very importantly, it's flat! So if you were thinking of walking a lot, this is a great place to do it with minimal impact on your body (and potentially swollen feet!). That said, public transport is very user-friendly and if you're feeling really brave you could cycle around too (and you'll definitely see lots of local women with bumps on two wheels - I may be one of them!) There's plenty to do in Amsterdam to keep you busy, but also lots of beautiful hotels that would make great luxury babymoon destinations if relaxing is just as important. (I would recommend Waldorf Astoria and Conservatorium if you're looking for a five-star hotel with an excellent spa, or for a slightly lower price tag but still plenty of comfort look at The Pullitzer or The Hoxton). Amsterdam is also a great destination if you choose to go away for your babymoon in the cooler months of winter or autumn. I've written lots of posts that will help you plan your Amsterdam babymoon, but these few should be the best places to start: Best Hotels in Amsterdam for all Budgets and Tastes, 100+ Free Things to do in Amsterdam, and Best Photo Spots in Amsterdam. If you've already been to Amsterdam a few times but yet fancy the same kind of scenery and atmosphere, then think about going to Utrecht or Rotterdam, the former is like a smaller version of Amsterdam, while the latter can offer a more urban and city-scape feel but with still plenty of hidden gems to uncover. Here's my city guide for Rotterdam. While I wouldn't recommend visiting during the peak summer months (because of the heat and numbers of tourists) Lisbon is a perfect babymoon city break destination, especially if you're heading away with some girlfriends. The city is beautiful and fascinating enough just to wander around (for the tiles on the houses alone!) but you can easily escape the city by hopping on a train and heading out to the coast or to do a tour of the famous palaces at Sintra. There are also some fab luxury hotels with pools and spas to enjoy at very competitive prices (Olissippo Lapa Palace and Porto Liberdade are ones I hear highly recommended) and please make sure you watch the sun go down over the city, because the light is incredible! Check out my city guide for Lisbon if you're heading there with good friends to plan a great Lisbon babymoon. Speaking of Portugal, Funchal is not going to be a logical choice for many people's city break babymoon as it's quite a faff to get to (with not many direct flights) but once you're there, Funchal in Madeira has everything; a city to explore, beaches to lie on, and several resort style hotels that can offer you plenty of comfort and relaxation. The rest of the island is also worth discovering which you can easily do by hiring a rental car for a day and going on a road trip. Sadly, you won't be able to try the island's famous (and highly alcoholic!) drink poncha, but you can enjoy fresh seafood and beautiful sunsets with a mocktail or no-alcohol beer! I stayed in the Hotel Porto Mare in Funchal and found it a really lovely resort-like hotel that had a great city and waterfront location. One city I'm desperate to return to with my partner is Ljubljana and while I'm not planning on getting pregnant again after this my second time, I would definitely say Ljubljana would make a great city break destination. The mostly pedestrianised old city centre with pastel-shaded houses and cobbled streets is perfect for gentle exploring, but if you feel braver you can make the walk up to the castle (or alternatively catch the funincular up!) and enjoy the best views of the city and surrounding countryside. Ljubljana surprised me with its small size but big personality with plenty of lovely restaurants, cafes and lunch spots, and trendy areas to find vintage shops and street art. My choice of hotel for a weekend city break babymoon in Ljubljana would be the Intercontinental as it offers a lot of luxury and an excellent location. Read my full Ljubljana city guide here. Bologna is the ultimate babymoon destination for foodies! The home of slow food and the culinary capital of the region that brings us the Italian delicacies ragu alla bolognese, (and not spaghetti bolognese! ), lasagna, parma and mortadella hams, balsamic vinegar, ravioli, and parmegiana reggiano, among many others, will satisfy hungry pregnant appetites (food restrictions aside!) and any lucky non-pregnant partners can also enjoy the fine wines the region produces. Away from food, there is plenty to see and do in Bologna, and the surrounding region, but even just wondering around the city centre under the famous porticoes will be entertaining enough. If you live on the other side of the world in Asia or Australasia, then all these European cities are going to be a bit far for you to get to but there is one place you could consider: Singapore! We've spent many a weekend in Singapore during our travels and while the last few times were with a toddler, it's never failed to be one of my favourite cities for exploring with just my partner. There's history to learn, varied museums to enjoy, and countless good restaurants and bars to spend your evenings in. It's also one of the few places where (as a pregnant woman or otherwise!) I really trust the street food so I wouldn't feel I'm missing out on that experience either. Here's my guide to Singapore with a toddler, but there are still some lovely ideas for things to do if your little one is still in utero, also I would definitely recommend the Fullerton Bay where we stayed, and you MUST do a high tea there too. Another cool destination to consider for those in the Southern Hemisphere (or not, if long flights don't put you off!) is Cape Town. I actually did visit Cape Town when I was pregnant - around seven weeks! - as I found out I was expecting the day before we boarded our flights to a friend's wedding in Franschoek. We spent a week and a half in Cape Town in total staying in an Airbnb in the V&A Waterfront area. I took part in a number of walking tours of Cape Town and the Woodstock area which is famous for its street art, and my partner and I went on a couple of road trips to Cape Point National Reserve, and down to Boulders Beach to see the penguins. While the flight was long, the good thing about Cape Town if you're travelling from Europe is you are roughly in the same time zone, and you can jump from winter to summer if you want! The are a few really brilliant luxury hotels you could consider include The One & Only, Victoria & Alfred and the Radisson RED. Lyric, from Asher & Lyric, went on a babymoon to Paris with her husband Asher and their toddler and aside from this adorable photo it sounds like it was a really special trip. You wouldn't think it would be the best place for a babymoon but my husband, toddler and I went to Paris for the babymoon of our second child and it was fantastic. For us, Paris is one of the most enchanting cities in the world and our personal favorite. It made for an epic babymoon because it was so nourishing for all of my senses. Everywhere we turned there was something incredible to eat, drink, or see. And there is no better time than while pregnant to have the most mouth-watering pastries that have ever been baked fresh out of the oven! We made a point to visit three Michelin rated restaurants, and loved sampling their eight to sixteen-course degustations! As a mother to be (for my second time) I felt especially connected to the human experience and how every soul comes onto this earth for their own special purpose. Shelley from Travel-Stained went to a city I would never really consider for a babymoon, Kuala Lumpur, but it does sound like it was perfect and a lot of fun! Kuala Lumpur, Malaysia might not be the first place you think of for a babymoon, but it's actually the perfect destination for an expectant mother. Many pregnant woman are always ravenously hungry or have unusual new tastes, and this is a foodie destination, if ever there was one. I made sure to hit both ends of the gastronomic spectrum during my stop in KL by visiting both a crazily chaotic food street AND a heritage hotel for high tea. At Jalan Alor food street, we wandered from stall to stall eyeing a never ending selection of tasty treats, before finally deciding on lok-lok from Fat Brother Stay and Wong Ah Wah's famous chicken wings. But at 86 year old heritage hotel, the Majestic Kuala Lumpur, I basked in the super soothing environment with a classic high tea. I indulged in cup after cup of Gold Blend Tea from the Cameron Highlands and a tea tray full of warm scones, finger sandwiches and delicious desserts. It was an absolutely perfect respite for this mama to be. The Orchid Room is the most popular area to enjoy High Tea at the Majestic Hotel, due to its incredible beauty. However, I recommend just popping in to take a few pictures, and then spending the rest of your visit in the Tea Lounge. It has comfy couches and plush armchairs that your aching back and swollen feet will thank you for. Please let me know if you have any other suggestions for top babymoon destinations in the comments. I'd love to hear where you went and what was so special about you babymoon. And remember to check out these babymoon travel tips and ideas too.